Draw a house… draw a tree… draw a person.. 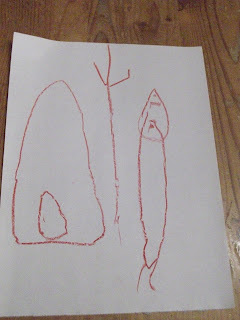 Asking a child to draw a picture of a house, a tree, and a person is a pretty common assessment technique, and one I’ve been using with my own little ones for years. You can use it with anyone age 3 and up. There’s actually an entire psychological evaluation centered around the exercise, but I don’t quite take it that far, LOL! 1. The house– a picture of where the child is on earth. From that place the child goes out and comes in again in the process of meeting the world. 2. Tree– indicates the child’s connection with his etheric body… The tree is connected with the spiritual world and the earthly world, above and below. It is also a home. 3. Person– shows the human being with an astral body. The house and tree in the pictures also indicate aspects of the human being. I love the fat, round, tall characteristics of Nicholas’s drawings. The lack of detail, the starkness, the archetypal quality to them. It’s a fun exercise to keep these tucked away, asking for new ones to be drawn every once in a while. Have you ever had a little one not want to draw a tree/house/person? I've got an almost 5yo who doesn't want to do so. He'll usually say that he doesn't know how or that he can't. Does that seem a bit odd? Does he not like to draw in general? If it was really important to me, I might have a couple of times when the two of us draw together, and then once he was comfortable I would ask him to draw his own. Also maybe split it up and ask for one at a time rather than all three at once? *loves* to draw, but mostly lines and large swaths of color – very bold in appearance typically. I had been going for the drawing together thing in the past. I'll just keep trying.